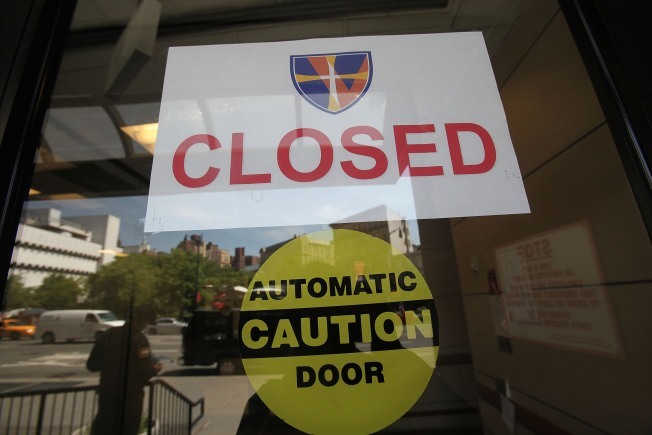 NEW YORK - APRIL 30: A "Closed" sign is seen at St. Vincent's Hospital after the hospital closed permanently April 30, 2010 in New York City. Twelve percent of stores are vacant on the busiest shopping streets in Queens, according to a report released today by Rep. Anthony Weiner. The report studied shopping strips in ten Queens neighborhoods, most of which are small and locally-owned businesses. And its findings are not good. One in 5 stores are closed or closing in Woodhaven and Rego Park's busiest shopping strips, Jamaica Avenue and Woodhaven Boulevard respectively. On Jamaica Avenue the total number of vacant storefronts is 73. A total of 1716 stores were surveyed in ten Queens neighborhoods--Rockaway, Rego Park, Flushing, Woodhaven, Forest Hills, Jamaica, Sunnyside, Astoria, Glendale and Bayside--and of these, 206--12 percent--were closed or closing, according to Weiner's report. Only four of the ten surveyed neighborhoods had vacancy rates below 10 percent: Flushing, Forest Hills, Sunnyside and Glendale. Flushing, with 7.14 percent, had the lowest rate. Weiner's office plans to survey Brooklyn next.